Michael Palmieri: Professor Hudson welcome back to the third episode of The Hudson report. It’s great to have you here. Michael Hudson:It’s good to be here. Michael Palmieri: So everyone who’s been following the news media for the last week or so has become–even if they didn’t want to be–pretty familiar with the case of Sergei Skripal and his daughter. He was once a double agent for British intelligence and recently there’s been allegations that he’s been poisoned by or attempted to be poisoned by Russian intelligence services. Although much of the coverage seems to be pretty breathless in condemning Russia for an attempted assassination. You seem to have a different perspective or perhaps believe that we should be looking somewhere else and the kind of larger implications of what this may mean. So can you start us off and kind of explain what you see to be going on here right now? Michael Hudson: Well I was puzzled at first about the whole treatment of the affair of poisoning of Sergei Skripal and his daughter because the treatment is so out of proportion–the reaction is so out of proportion–that it’s obvious that the issue is not about the poisoning itself. First of all there’s no evidence to show Russian involvement. But the important thing to realize is that even if there were a government assassination attempt, the reaction is entirely different things. It’s really about international diplomacy and NATO maneuvering for a military posturing and the reaction has no connection at all according to the poisoning, they’re only using the poisoning as an excuse to wrap a policy that was already thought of and sort through before the actual Skripal Gate occurred. I think anyone who’s seen James Bond movies knows that 07 can kill enemies. And the U.S. assassinates people all the time. It’s killed foreign leaders like the president Allende in Latin America and the whole wave of political terrorism that followed–killing tens of thousands of union leaders, and university professors, and land reformers, and the Obama administration targeted foreigners for drone strikes. Even when this kills large numbers of civilians as collateral damage. No foreign country broke relations with Britain, or the United States, or Israel, or any other countries using targeted assassination as a policy. So this pretense that Russia has killed someone even without any evidence or with any trial is implausible on the very surface. So, the question is why are they doing this with Russia? Why are they imposing sanctions and mounting a great publicity campaign? And I think the answer has to lie in looking at why are they doing this now. Timing is the key. So let’s step back a minute and note what seems to be out of the ordinary in the British and US and NATO reaction. For starters the sanctions are supposed to be part of a diplomatic game plan designed to counter the presumed benefits to Russia. When the United States and Britain imposed banking factions they said this is to show you that if you think you can gain we’re going to make you lose even more than you gain. What’s bizarre here is that what gives Russia’s benefit in killing an ex-British spy who has been returned to the West in a spy trade and according to the reports wanted to go back to Russia. Nobody suggested any benefit to Russia at all and obviously there isn’t any. Therefor the sanctions are independent of any benefit and hence the poisonings. And regard to the poisonings themselves, the basis of Western law is a presumption of innocence and reliance on evidence. No judgment without evidence is supposed to be given. Otherwise it’s a rush to judgment or a “He Said, She Said” affair. And the second principle of Western law is that both sides get to present their case. But in the Skripal affair, which is now being called Skipal Gate, there is no opportunity for Russia to present its case. The Russians have not been given samples of the poison that could exonerate them. They haven’t even been admitted to see Mr. Skripal, although he’s a Russian citizen, or his daughter. who’s now awake and recovering. 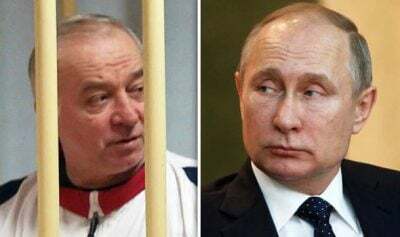 The British will not even let Skripal’s relatives come to Britain. So the reaction is so out of proportion that obviously there’s a disconnect. This is a double standard and there’s a pre-existing prejudice here. So I think instead of retaliation there seems to be a pre-determined strategy of attack on Russia and an attempt to isolate its economy. And the question is: why is this occurring? And what are its aims? I wondered at first is it payback for the U.S. failure to use ISIS and Al-Qaeda as America’s foreign legion to destroy Syria and replace Assad with a pro U.S. ruler? Grab its oil? The frustration about Crimea’s vote to join Russia? There certainly seems to be an economic cold war that’s being escalated and the intention is to isolate Russia but instead it’s driving Russia, China, and Iran closely together. So what we have is a threat to isolate Russia if it does not do certain things. And so to solve the Skripal affair you have to think – what are these things be that the United States and Britain wants? Well one thing is for Russia to pressure North Korea to dismantle its nuclear program which of course it will only do if the United States demilitarizes the peninsula. Another U.S. aim is to have Russia withdraw from Syria. President Trump announced last week that he wanted just to pull out of Syria. But the question is if he pulls out what will Russia do? Are these sanctions a stick saying, well OK, you see what we can do to hurt Russia but we’ll drop all these sanctions if you withdraw Russia from Syria. Maybe another aim is to get Russian concessions not to back eastern Ukraine. Michael Palmieri: Professor Hudson I was just going to ask you… if you were to turn open the pages of The New York Times or other mainstream press pages that have been giving this quite a bit of coverage… one of the reasons that they may have used chemicals, and I’d love to see your take on this, is simply to send a chilling effect throughout the world. It wasn’t just that they wanted to kill Mr. Skripal but that they wanted to send some kind of message. That seems to be what a lot of the press coverage is stating the reasons are for Russia to conduct something like this. Michael Hudson: The United States when it wants to isolate a country traditionally accuses them of chemical warfare. This goes back to George Bush’s accusation that Iraq had chemical weapons of mass destruction. We know that was a lie. It goes back to Obama’s claim that Russia and Assad were using chemical weapons in Syria. So I think when they say that Russia or Assad or Iraq is using weapons that’s part of to generate a fear that is supposed to be met by military preparedness and defense. Now last week President Trump repeated what he said when he was running for president. He wants European countries to pay more of the military cost of NATO. He’s been saying this for over a year. And I think this is what this Skripal affair is really all about. The aim by using something as emotional as chemical weapons is to create an anti-Russia hysteria that will enable NATO governments to pick up much more of the military budget than they are now doing from the United States. It will force all their countries to pay 2 percent of their GDP to the U.S. Military-Industrial-Complex. So essentially, the Skripal affair is to frighten populations to enable NATO to try to push through more military spending on the U.S. defense industry and to pick up more of the cost of NATO, when the populations are going to say… wait a minute, the European Eurozone budgets can’t monetize a budget deficit… if we pick up more military spending for NATO than we’re going to have to cut back our social spending and we can’t have both guns and butter. So the Skripal is to try to soften the European population, to frighten it into sayin… yes we better pay for guns, we can do without the butter. So you’re having there exactly the fights that happened in the United States in the Vietnam War in the 1960s. And I think there’s also an attempt to use these accusations as a means of employing sanctions to disrupt Western trade with Russia and China by blocking insurance companies such as Lloyd’s of London from insuring shipping and other transportation. Banks saying we’re not going to give you these services anymore, Russia. And the parallel sanction would be to block U.S. banks. Michael Palmieri: Yeah actually I wanted to jump in here because I mean the irony certainly isn’t lost for anyone who can recall about a year ago to the month. There was a pretty interesting article and a series of articles released by the Guardian which pretty much demonstrated that billions of dollars were moved out of Russia in what they called a “global laundry mat operation” to anonymously owned U.K. companies and banks with Lloyds playing a large role, Barclays, and a host of others… I even believe Citigroup and Bank of America were involved as well. These were actual documents that pretty much proved this kind of operation going on. And it seems that when it occurred there…there didn’t seem to be as much of an outrage nor as much of a concern of painting it as something as important. So can you comment on exactly what that was, and what seems to be a common pattern of these larger banks collaborating with Russian oligarchs? Michael Hudson: Since 1991 when the Soviet Union was dissolved the capital outflow to the West has been about twenty five billion dollars per year. That means a quarter of a trillion dollars in a decade and half a trillion dollars in 20 years. And the outflow has been continuing until recently at 25 billion a year. Just in the last two weeks you’ve had in the paper the kerfuffle about the Latvian banks that were vehicles for Russian money laundering… as if the West was shocked to find out that they were actually laundering money for Russia. That’s why Latvian banks were established! Already before the fall of the Soviet Union in 1988 and 89, Grigory Luchansky, who worked for the University of Latvia in Riga, became the vehicle setting up Nordex as a way for the KGB and the Russian military to begin moving its money out of Russia. Billions of dollars a year through the various Latvian banks for the last 25 years. The main business of Latvian banks has been to receive Russian deposits and then move them into the West either into British banks or into Delaware corporations. I was research director and economics professor for the Riga Graduate School of Law for some time -maybe six or seven years ago – so I dealt with the Latvian government, with a prime minister, with bank regulators regularly, and they explained to me that the whole purpose of Latvian banks was to encourage Russia capital outflows to the West. And from the United States point of view, this was a way of draining Russia. It was the idea of pushing neoliberal privatization on Russian utilities, natural resources, and real estate and saying… first of all, privatize these public assets like Norilsk Nickel and oil companies like Khodorkovsky… and the only way you can make money now that you’ve privatized them, you have them in your hands, and the only way you can cash out since there’s no money left in Russia is to sell them to the West. And so that basically they sold them to the West while accumulating huge embezzlements through false export invoicing, moving the money into British banks primarily, and that’s why you see the Russian kleptocrats buying very conspicuous properties in London and bidding up the price of London real estate. Now all of this has drained Russia tremendously and the United States by threatening to stop the banks drain, and in fact, to begin grabbing the assets of Russian kleptocrats. What’s the effect? The Russian kleptocrats are now frightened and are moving their money out of England, out of the United States, out of Delaware corporate relations, out of the Cayman Islands or wherever they have it back into Russia. So while there are sanctions against U.S. banks giving money to Russia. You have this huge dollar inflow and sterling inflow back into Russia that Russia is using to build up its gold stocks and all of this. So it’s a hilarious example of trying to hurt Russia by threatening the oligarchs, but actually stopping the capital outflow and that’s occurring as a result of privatization. Michael Palmieri: Wow. Certainly not a take that I’ve heard laid out anywhere that I’ve been reading. And that’s why we have you on the show Professor Hudson, so thank you again for giving us this very nuanced and certainly different insight. Michael Hudson: Well I’m glad we have a chance to talk about the news.